For me starting having a positive start to each morning really is the best way to keep me on track for the whole day. That may sounds stupid but one lazy morning and unhealthy breakfast and I'm thrown. I work best by getting up and ticking things off a to-do list, and I'm sure I'm not the only one. Since I started working from home morning motivation has definitely been something I have struggled back and forth with. With no immediate rush to get up, showered and ready I sometimes find myself lost and distracted - which is NOT good. So I've taken it upon myself to set up a little routine for each morning to get me up, out, active and in the best mood possible to sit behind my desk for hours on end. The thought of running the second I get up always has me with the same thoughts and response... 'nah'. So instead of pressuring myself to get up and run I've started to get up and head out on a walk. A power walk. Up hills, along the beach, round the park, you'd be surprised how much exercise walking actually is. Of course if I'm in the mood to run, I do - that's an extra bonus. To accompany me on these walks/runs I thought it would be a great idea to download an audio book. I'm obsessed with reading but I find time runs away with me each day and I never really have a good amount of time to delve into a good story, so listening to one seemed to kill two birds with one stone. I still get to hear the stories, plus I'm out getting exercise and giving my body the best start to the day - win, win. I'm currently on a 30 day free trial with Audible. 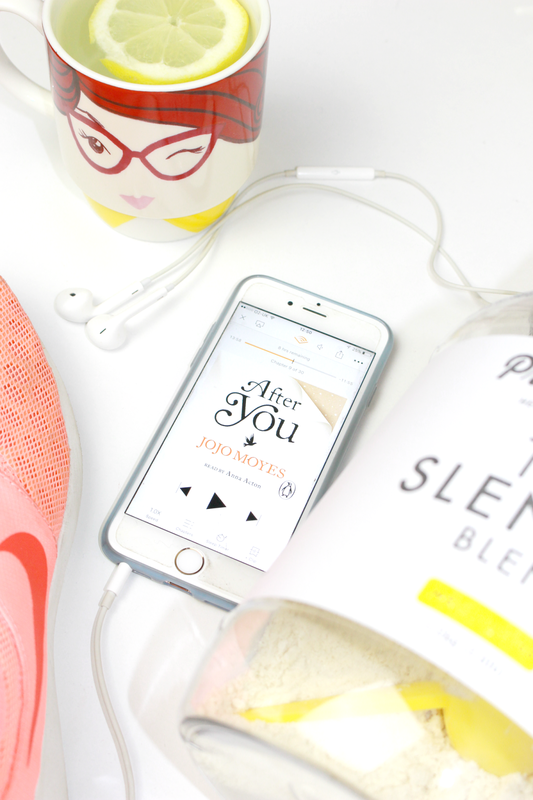 I'm really enjoying the book I am listening too (After You, Jojo Moyes) and I think I may just become addicted to audiobooks at this rate. Do let me know of any of good apps or services for audiobooks though - I'm worried with Audible you only get one choice a month... that doesn't feel like enough! Once I'm back from my walk/run/fresh air (I usually aim to go for around one hour but it does depend on what time I head out the door) I head for a shower and get dressed into some work clothes. By work clothes I mean leggings and a sweater. I work at home and there is noway I'm sitting around in jeans and a cami if it's not needed.... that's just insane! It's then time for my hot water with lemon. There are so many benefits to drinking this each morning I've ensured that it has become a staple for me daily, followed by my regular 100 cups of green tea! 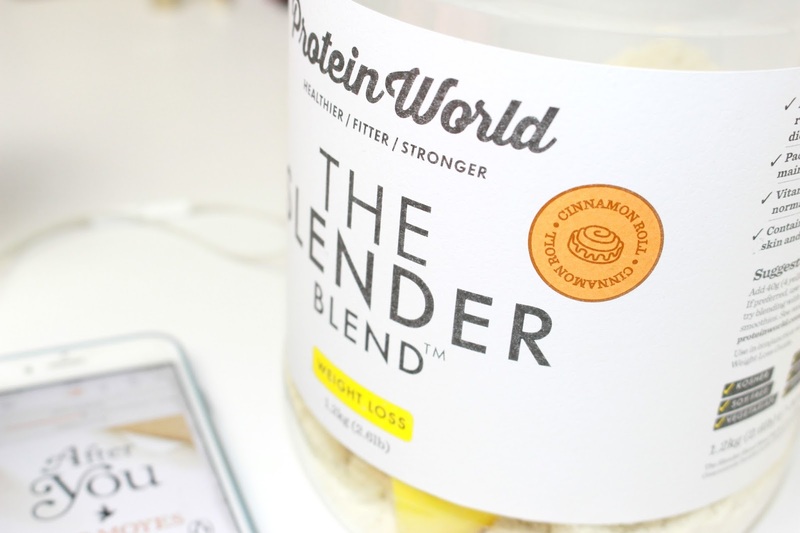 For breakfast most days I then fix myself a Protein World Slender Blend shake. I am trying to loose some weight that I seem to have gained over the last few months and I really love the products from Protein World, plus it really can keep me full until my lunchbreak! Ones I've had a little sit down and drank my shake it's time to make a green tea and head to my desk! Then work, work, work until lunchtime! So there you have it - my weekday morning routine.... weekends usually start with a gym session, nail appointment or hangover, but that's another story! Is the slender blend shake good? I've been debating replacing breakfast with it! Does it fill you up? © Aloha Kirstie | All rights reserved.